The Mykola Lysenko Secondary Special Music School of Kyiv recently presented “Five Soirees of Performance Art.” The concert programs, dedicated to the 165th birthday of the outstanding Ukrainian composer after whom the school is named, featured symphonic, choral, and piano music; works for strings, winds, and percussions; music from the Age of Baroque (Handel’s Alleluia) to contemporary music (Astor Piazzolla’s “Autumn”) as well as jazz (Gershwin’s “Prelude”) and the works of foreign and Ukrainian composers, including Lysenko. Although the performers were very young, the audiences’ impressions of the concerts were not contingent on the moving sight of the finely dressed teen musicians. Almost all of them are prizewinners of national and international competitions. Their professionalism and stage experience is so considerable that no allowances should be made for their age. The meticulous, years-long work of the students, their superb teachers, concertmasters, and self-sacrificing parents are helping this famous school maintain its impeccable reputation as a teaching institution for especially gifted children. During the preparations for the concert and the concert week, many of the young musicians had to rehearse their solo parts and then perform in a band or school orchestra. Fortunately, the young musicians are at the age when a labor of love brings pleasure regardless of difficulties. It was a real celebration not only for the talented, beautiful, and elegant soloists, who are full of energy and love of music and their difficult and unprofitable profession, but also for their parents and friends. The general euphoria only magnified the spectators’ delight in the skillful performance of these young musicians, who garnered ovations, “bravos,” flowers, and the admiration of their peers. The concerts were organized by two members of the school administration, principal Valentyn Sherstiuk and vice-principal Olha Savytska, who were assisted by the stage director of the “Five Soirees,” Volodymyr Lukashev, the artistic director of the Philharmonic. The Lysenko school is over 70 years old. Many of its graduates went on to become distinguished figures of Ukraine’s modern musical life, including Ihor Shamo, Yan Frenkel, Volodymyr Kozhukhar, Nina Herasymova-Persydska, Naum Shtarkman, Oleksii Hryniuk, Volodymyr Bystriakov, Oleksandr Zlotnyk, Taras Petrynenko, Pavlo Zibrov, and many other, no less brilliant, stars. Among the beautifully trained artistic virtuosos who feel confident on stage were some amazingly gifted and sensitive musicians, who regularly perform in concert and even do some touring. It is impossible to be absolutely objective in any artistic profession: some like one thing, while others prefer something totally different. Diverse and dynamic programs captured the attention of this audience. Solo parts were performed to the accompaniment of concertmasters or the school’s symphony orchestra under the baton of Serhii Solonka. With its clear sound in purely symphonic pieces and the most difficult accompaniments, the orchestra displayed one unusual trait: all the musicians on stage showed their passionate engagement in the music. In an orchestra, as a rule, even the most talented musicians bend to the will of the conductor; otherwise, it is impossible for the orchestra to create a harmonized sound. But in this case, the conductor’s clear intention, combined with the enthusiasm and passion of his young charges, led to an astonishing result. The same could be said about the choral ensembles of the Lysenko Music School: a male choir consisting of boys and teens (artistic supervisor: Yurii Kurach) and a girls’ choir (artistic supervisor: Oleksandr Zavolhin). When the children performed Mozart’s “Requiem” during the first concert of the series, many in the audience, including professional musicians, were brought to tears. The performers and the packed hall seemed to be exchanging energies. 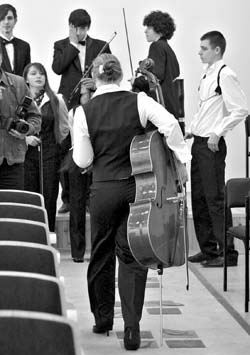 Graduates of the Lysenko Music School also took part in the soirees. The performance of one young musician featured the State Chamber Ensemble “Kyiv Soloists,” under the baton of Bohodar Kotorovych. Many members of this choir also went to the Lysenko school. The greatest advantage of the Lysenko Music School is that it does not limit training to teaching music at the highest professional level. Here the artistic atmosphere is combined with a friendly one; playing in a band grows into friendship, and friendship naturally develops into joint musical training. The school raises a person to become a personality; a person who has been playing music since childhood learns to think and feel this art. Such people develop an acute sense — a taste for life — without which living is mere existence.